We place a high priority on the satisfaction of our accessible mobility customers and pride ourselves on delivering great service. Here’s what our customers had to say. "I have worked with Stalls Medical and Adaptive Vans. for over 25 years beginning with the purchase of a three-wheel Fortress electric scooter through Jerry Stalls before he formed Stalls Medical. Since then, I have used Stalls Medical for three power wheelchairs and an adaptive van. I have always felt that Jerry and the staff at Stalls Medical place the highest priority on the client and the client’s needs. They show much care and compassion in their work to insure that the products and services provided meet the needs of each client they serve." "You and your staff were most gracious and a pleasure to work with during a difficult time." "From the moment we came to Stalls Medical, to the moment we left with our new van, the experience has been nothing but first class, fantastic… like working with family." “Cason was very thorough when giving instructions about the power chair. It is a beautiful piece of equipment and I appreciate all the time Cason took when measuring for my custom chair. It’s perfect and I am so happy to have it." 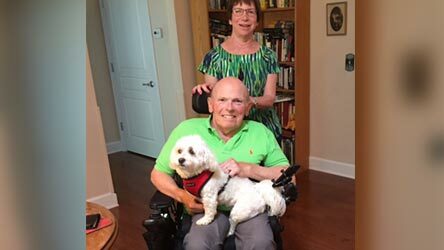 "My wife and I were told about Stalls Medical and Cason after meeting with another company to work on getting a wheel chair for my wife. We were just left very un-impressed with the first company we met with and learned we did not have to just settle for someone. Needing a wheel chair and seat lift for our Tahoe, well this was all a new experience for us. After meeting with Cason to talk about my wife's needs the difference in his presentation and the other experience we had was night and day. We left that meeting feeling Cason had really put our best interest up front and not knowing how this process worked told us things and did things we had not even been told about. Its emotional enough having to do something like this in the first place, but Casons personality and attitude made a huge difference. The entire team at Stalls Medical has really been great to work with."